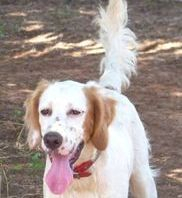 Poppi is a lovely white & orange female with a high-drive personality. She has a very good nose, is very intense and always watches the horizon. 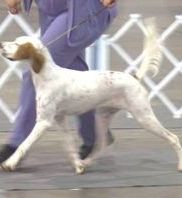 She's a smart dog and adjusts her running style based on the terrain and whether she is handled off foot or horseback. 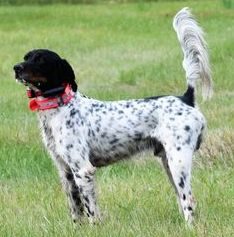 In addition to AKC and FDSB field trials, Poppi has been shown in UKC dog shows. 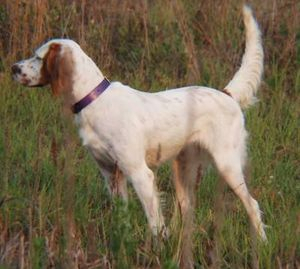 UKC's English Setter breed standard describes the differences between "field" and "show" setters, and both types are rewarded in the show ring, as long as they are well structured dogs. Poppi IS a well structured dog, and as such, has earned her UKC breed Championship. 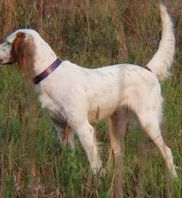 In fact, in 2008 she was ranked the #2 English Setter in UKC (2008 show standings). Most importantly, Poppi is a pleasure to have in our home. Easy-going and happy, she is a people pleasing dog who enjoys spending time with her family. Poppi's first litter, born in 2014, is showing a lot of promise. Watch for Brio, Bet, Jet, Porsche, Jane, and Rafe to start winning the ribbons! !! !NEWS FLASH!!! 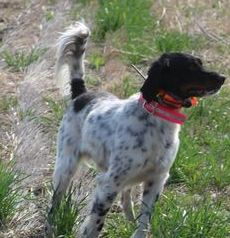 Poppi to be bred to St. Jude's Champaign Fenway!!! "Pesky" is a handsome son of CH Long Gone Boston. He has shown a high degree of trainability and showed a lot of point and desire as young as 7 weeks. We are hoping to combine that biddable temperament with Poppi's exciting run to produce our next amazing litter.